Imagine a man totals up the TOTAL EYES. The word in French for total is the regular ER verb totaliser. To remember this, imagine a man counts the TOTAL EYES. The man in the cartoon reminds you that the noun, le total is masculine. Masculine word = male character. 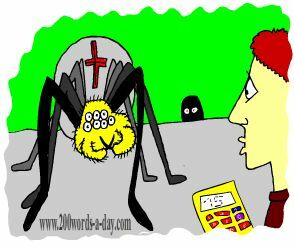 Cartoon Memory Triggers will help you to increase the total French words you know, and have them ready to use. When you want to remember a word... think of the pic! total! totalise ! totalisons ! totalisez ! ⇒Totaliser is a regular ER verb conjugated in like 5000 others. These are the most common verbs in French. ⇒Learn totaliser and it will reinforce the pattern for ALL those other ER verbs. ⇒ You can more easily remember words and verbs like the French verb totaliser - French for total - using the techniques of the world's Memory Masters. 200 Words a Day! Free Daily French Lesson Online - the French verb totaliser - fully conjugated. French Learning Made Fun and Fast with your free Daily French Verb Lesson - totaliser.